It was a battle of two divisional leaders as the Boston Celtics(26-7) welcomed the San Antonio Spurs(29-5) to the TD Garden on Wednesday Night. The Celtics came into the game without star Power Forward Kevin Garnett who was still missing with a calf injury. The Spurs were looking to bounce back after a demoralizing 128-115 loss to the New York Knicks. Head Coach Greg Popovich decided to rest his starters for the final three minutes instead of attempting to overcome an 11 point deficit in that game. The Spurs' gameplan was always going to be to try to take advantage of Garnett's absence. Garnett's replacement, Glen Davis, never had a chance of matching up with Tim Duncan simply because of the difference in size. Celtics' center Shaquille O'Neal is unable to play huge minutes as he is in the twilight of his career which forced Rivers to play a smaller lineup as the game wore on. This meant that Nate Robinson and Glen Davis played extensive minutes giving the Celtics more offensive firepower but sacrificing some defensive resolve. This led to a very entertaining open game that was a joy for the fans in TD Garden to watch but nerve wrecking for both coaches. The lack of structure was evident throughout the game as both sides had success putting points on the board and shot high percentages from the field. The game flowed back and forth as neither team never truly grasped a foothold in it. They came into the fourth quarter separated by just 6 points after the Celtics had put together a 10-0 run late in the third before George Hill's buzzer beater ended the Spurs' drought. The game appeared to be destined to go down to the wire. Consistency was the key in every facet of this game as both teams continued to trade baskets at both ends of the floor into the fourth quarter. Rajon Rondo's assault on the record books of the NBA took another positive step as he added 22 more assists to his total for the season. Rondo was constantly putting his sharpshooters in position to score and they were happy to take advantage of the opportunities as Paul Pierce scored 18 points, Ray Allen scored 31 points and Glen Davis added 23 points. Rondo was obviously feeling no ill effects from his recent ankle injury which led to the Celtics shooting an incredible 61.3% from the field. The Spurs only shot 45.3% from the field but turned 17 Boston turnovers into 29 points. Led by the trio of Tim Duncan, Manu Ginobli and Tony Parker, the Spurs stayed with the Celtics who probably couldn't believe that they hadn't wrapped the game up with such an impressive shooting percentage. The Spurs had 9 three pointers to the Celtics 5 and only missed 1 of their 17 free throws opposed to Boston's 7 of their 15. Rondo came into the game leading the league in assists and steals and came out of this game with a triple double that he earned on the final play of the game. 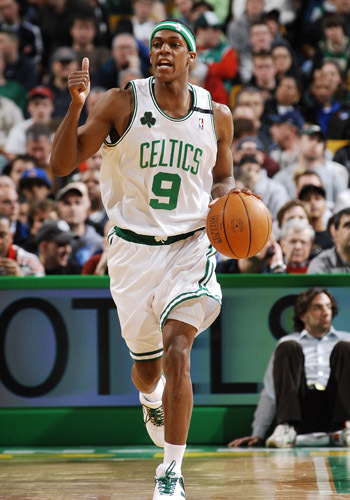 Rondo had 12 points, 22 assists and 10 rebounds that was ultimately the difference in the game. The game appeared to finally be settled when Ray Allen scored 5 successive points in the last two minutes to give the Celtics a 7 point lead. Allen hit a three pointer from the wing to give his team a 5 point lead with 1:37 to go before stealing the ball from George Hill on the next possession to score a simple layup. The Spurs responded with a similar series of events inspired by Manu Ginobli. Ginobli hit a difficult three pointer(1 of his 3 on the night) to bring the Spurs within 4 before a quick Tony Parker steal led to a simple basket that meant the Celtics led by 4. That lead was quickly halved as Ginobli intercepted a Nate Robinson pass and sent Richard Jefferson through. Jefferson was fouled and scored both three throws. Paul Pierce went down the other end but missed a 16 foot-jumper that led to a foul on Ray Allen. On a night where every shot appeared to be falling, Ray Allen hit all three of his previous free throws and 13 of his 16 field goals, Allen missed both shots. The Spurs couldn't believe their luck as Allen is a 91% career free throw shooter and revered for his clutch shooting. Manu Ginobli wasn't waiting around to second guess anything as he grabbed the rebound as the story looked set for a fairytale ending for the Spurs. There are probably fewer than 3 players that the Celtics would have wanted to see with the ball in their hands for the game winning shot than Manu Ginobli. Ginobli took the ball from Antonio MacDyess and stepped back behind the three point line looking to win the game but Paul Pierce played great defense and blocked the final shot before it could get anywhere near the basket. Rondo fittingly grabbed the rebound to put a stamp on the victory for the Celtics 105-103. The Spurs(29-6) will travel to Indiana to play the Pacers on Friday Night while the Celtics(27-7) will host the Toronto Raptors on the same night.